I have been thinking about you. I have also been thinking about a sand painting, by Rosie Yellowhair. It is in the Heard Museum in Phoenix, and it is titled "Navajo Emergence Story." I wasn't able to find an image of it to share with you; but I did find some other sandpainting by Ms. Yellowhair (I know; her name is such a delight!). This image is a Thunderbird. I found it on this fascinating website. You might be tempted to suppose that there is something to be skeptical of in the sandpainting- not at all. 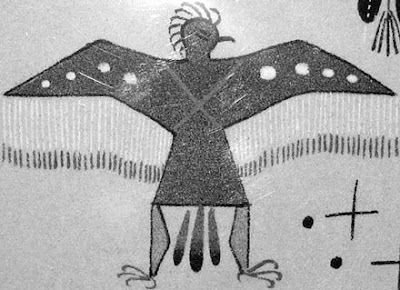 It was there, on the CSI site, to illustrate visually what a Navajo Thunderbird looks like. I'll bet you were just like me, and didn't even know that there was a question about Thunderbirds actually existing in times past, perhaps as a sort of companion animal for Sasquatch? Nearly all foolishness aside, the Committee for Skeptical Inquiry does exist, and thank the gods and goddesses of Reason for it.